Fabergé | 30'600 € Tax inc.
Fabergé, inventor of extraordinary precious objects, has chosen to develop a complete range of watches in association with master watchmakers. Working together, we create astonishing and enchanting timepieces that combine the science of measuring time with the imaginative freedom of Fabergé. The design of these simple or complex watches for men and women is based on one core quality: the unexpected. Peter Carl Fabergé’s creative genius became legendary for his ability to work with precious materials, proportions and patterns, just like a painter composing his canvas. Naturally curious and open-minded, Fabergé was engaged in a constant quest to surprise and delight. While he was first and foremost a creator of jewellery and precious objects, Peter Carl Fabergé also turned his hand to timepieces. 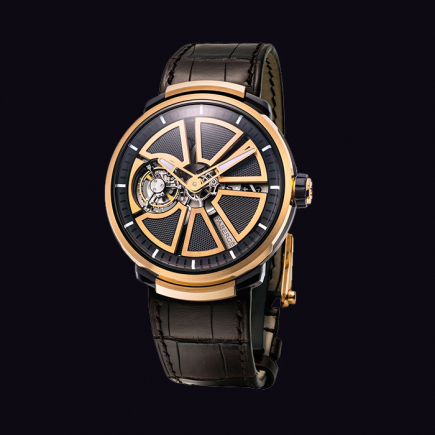 The timepiece collections have been designed to kindle these same emotions. The new Fabergé timepieces are contemporary creations that encourage unexpected combinations of shapes, materials and functions. They represent a bold move in new directions, constantly adapting to the trends of the times, harnessing the power of technology and innovation to create wonderment. As with Fabergé jewellery and objects, these new timepieces do far more than simply tell the time. They are experimental laboratories for testing new ideas about the world and aesthetics. Their rightful place is on the wrist, which serves as a showcase. Each creation, at once a timepiece and a work of art, thus plays a new role: to attract and persuade with a convincing message. 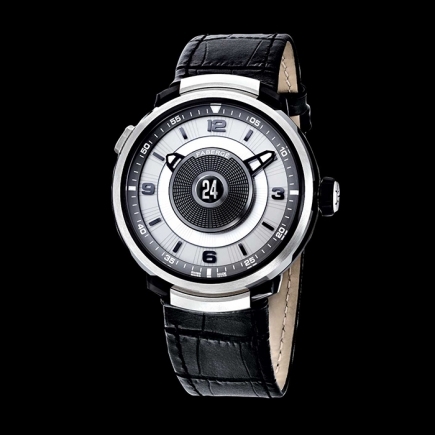 In fact, every Fabergé timepiece sets out to capture a precise moment in a changing world. 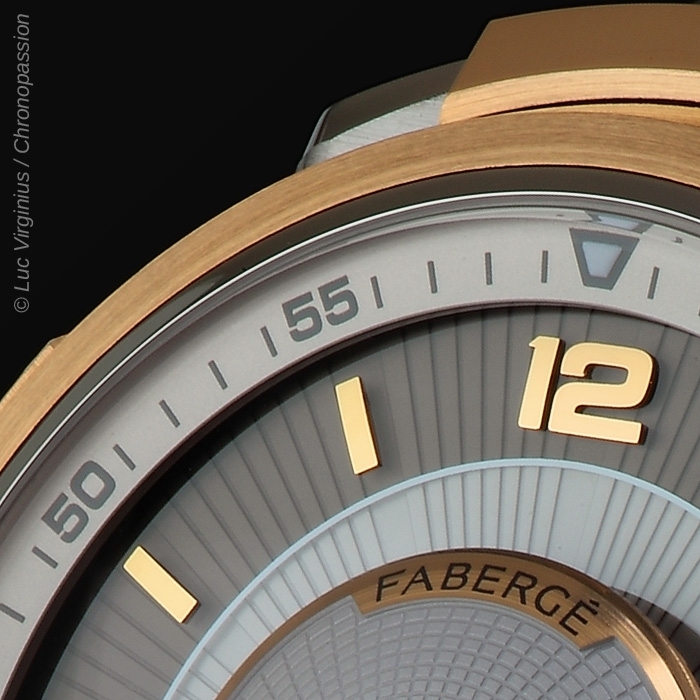 Their mission to bear witness roots Fabergé watches deeply in the reality of the present moment. And so they adapt to a way of being, thinking and living. Just like today’s women, they are lively, elegant, spirited, unique and unafraid to be themselves. 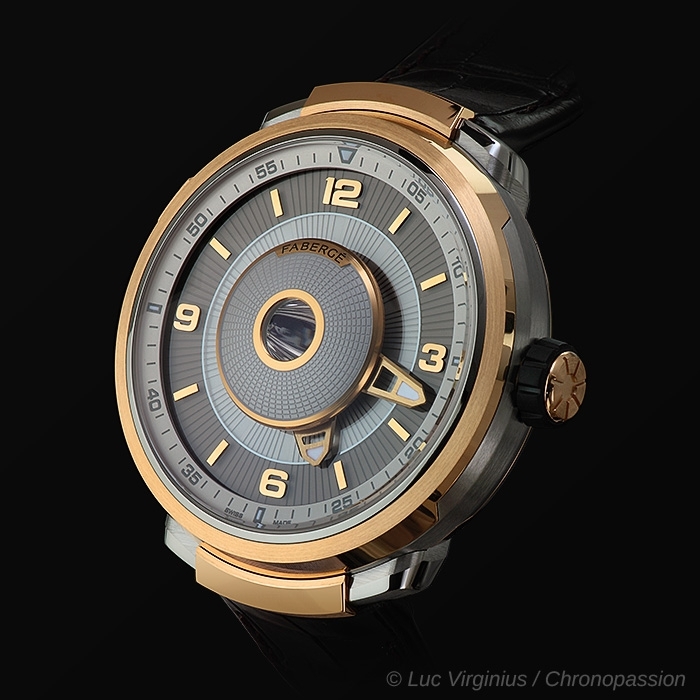 Meanwhile, the men’s creations focus on powerful, distinctive and innovative design packed with technological prowess. 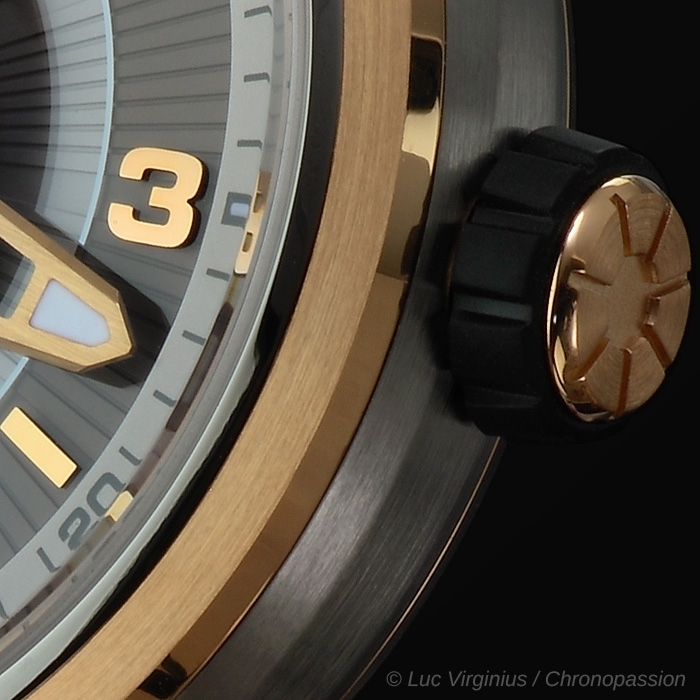 Every watch in the catalogue also hides a number of astonishing details that only come to light when examined closely. 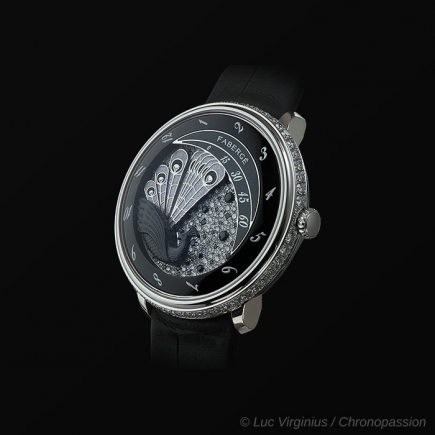 The design of Fabergé watches mirrors the creative principles of Peter Carl Fabergé. As with his very first creations, great attention is paid to perfectly balanced proportions, the superimposition of delightful materials, the interplay of various patterns and, above all, original colour schemes. The visual richness obtained by these variations in tone is essential to Fabergé’s aesthetic approach. From the outset, Fabergé turned towards established masters to design and produce its timepieces. Only they were capable of capturing Fabergé’s watchmaking vision perfectly in accordance with the strict rules of the Fabergé standards of workmanship. With each new creation, he called on their expertise and imagination to pinpoint the most apt solution and bring his ideas to life. From the design and manufacture to the decoration and final execution, every single aspect of their craft was called into use. 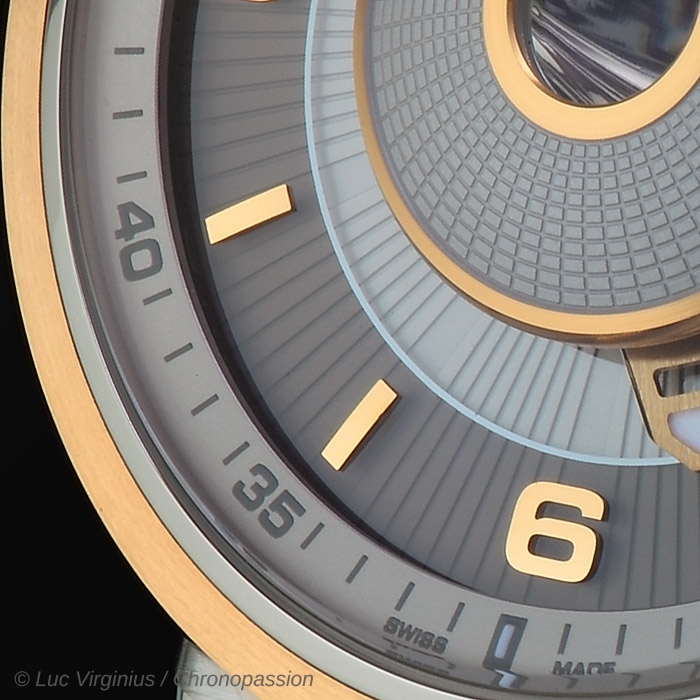 The self-winding Fabergé Visionnaire DTZ adopts a logical and intuitive method of displaying two time zones simultaneously, perfectly suited to the lifestyle of those who need to keep track of the time in a second, distant location. With a specific technical endeavour in mind, Fabergé adopted the pragmatic method originally employed by the son of the house’s founder, Peter-Carl Fabergé, in turning to the most adept masters of any particular craft. 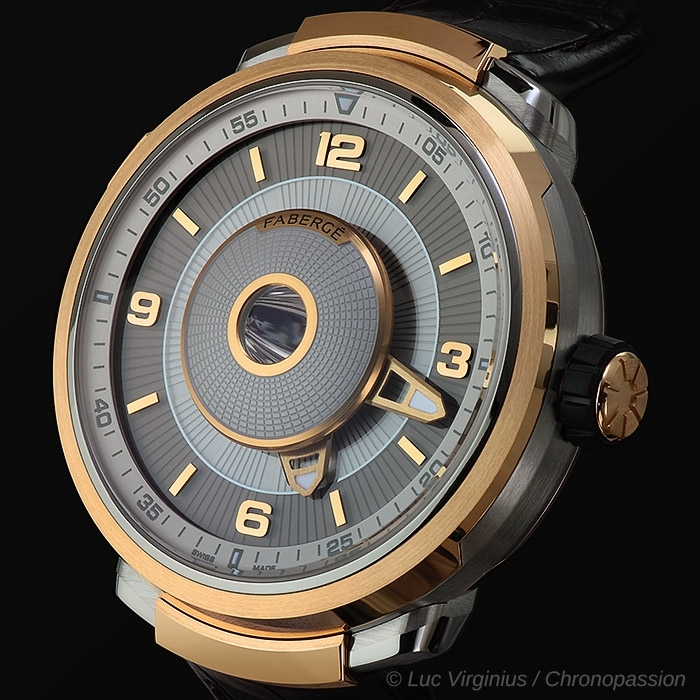 The art of turning complex horological concepts into a working reality has been the sole business of independent Genevan watchmaker Agenhor, and its founder Jean-Marc Wiederrecht, for more than 30 years. This unique interpretation of the GMT complication was recognised by the expert jury of the 2016 Grand Prix d’Horlogerie de Genève (GPHG) as the best watch within the ‘Travel Time’ category. 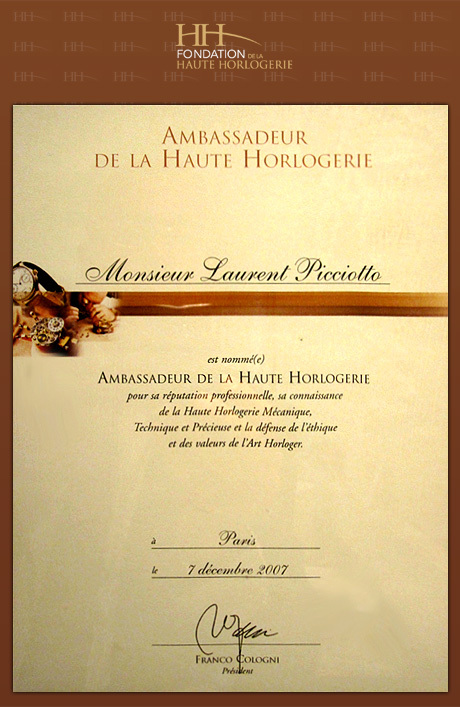 Fabergé is honoured to have received the prestigious accolade for the second consecutive year, following the success of Lady Compliquée Peacock at the 2015 GPHG. 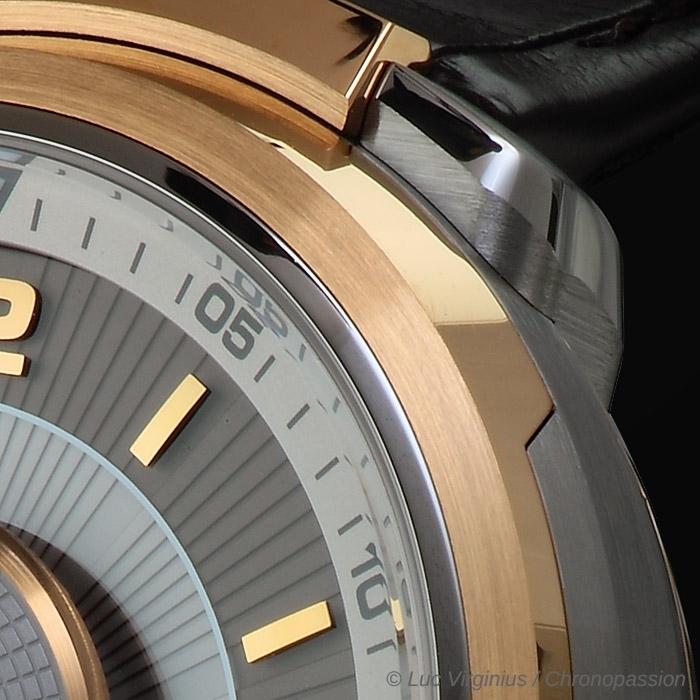 The design of the new Fabergé Visionnaire DTZ employs a slim bezel, complex lug construction, multi-layered dial construction, fluted crown and a linear, decorative motif radiating from the centre of the dial. The aesthetic is undoubtedly bold and contemporary but also suggests the renowned grandeur of Fabergé's historic legacy. 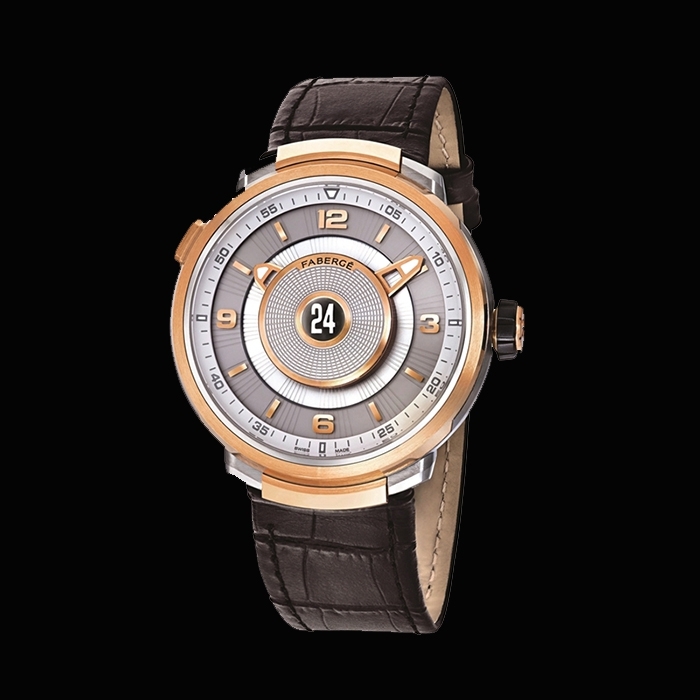 The Fabergé Visionnaire DTZ presents the hours and minutes of the local time zone with peripheral, open-worked hands rotating around a raised, decorated dome located at the centre of the dial. The hour of the second, remote time zone can then be viewed through an aperture at the centre of the dome. This jumping hour time zone is displayed using a small 24-hour numerical disc mounted on the reverse of the watch's Agenhor-developed AGH 6924 calibre. 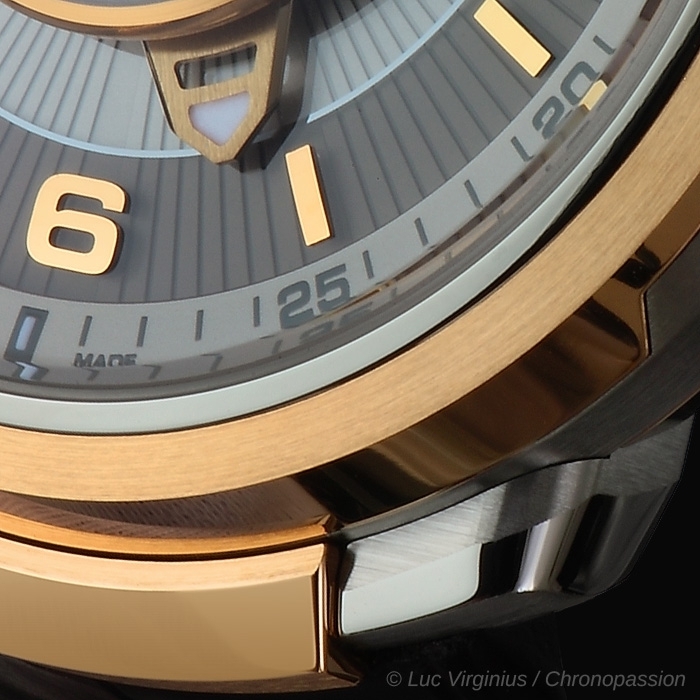 Only the current hour numeral is visible through the aperture, optically amplified to a bold, legible format by a magnifying element and brought into sharp focus by the mirror-finished interior of a cone that runs from the back of the movement through to the uppermost point of the dial. The clever use of the 24-hour disc means that no AM/PM indication is needed, keeping the dial free of superfluous registers. Developing the optimum shape of this cone took considerable work; not only was the cone required to draw in light from the dial side, but the encircled numeral needed to be presented with the lowest possible levels of distortion and reflection. 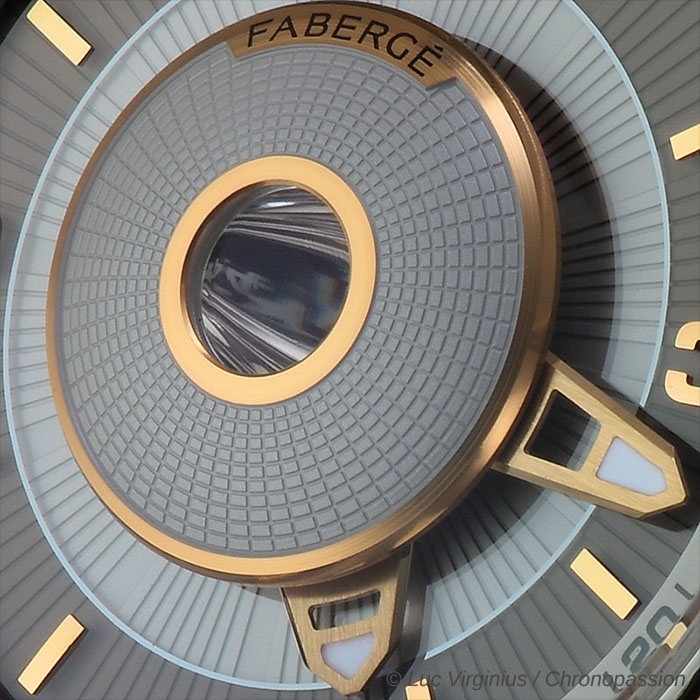 The bespoke shape of the cone means that the second time zone hour is only apparent when viewed straight-on, remaining hidden from prying eyes, one of the technical surprises that Fabergé delights in offering. 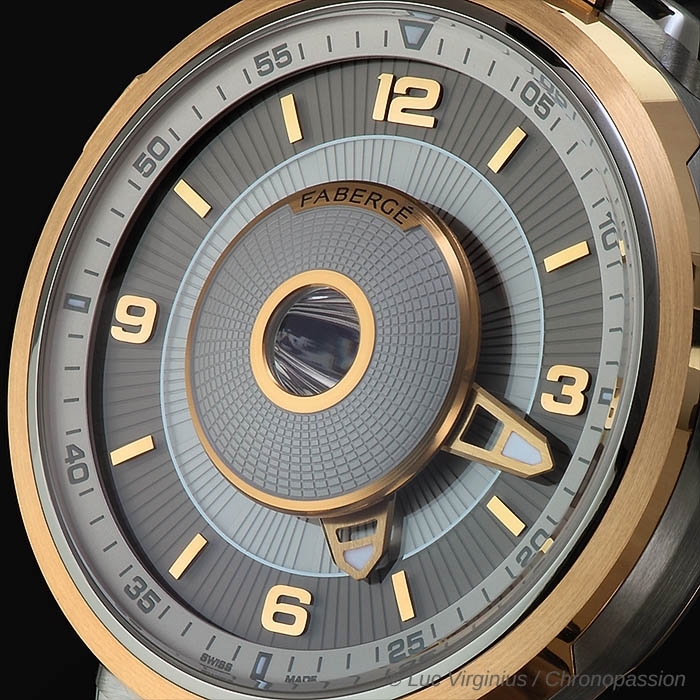 Each Fabergé Visionnaire DTZ is water resistant to 30m as well as featuring a domed sapphire crystal and anti-reflective treated sapphire crystal case back. Both are presented on an alligator or rubber strap with matching gold and titanium folding clasp.